When I returned home from my recent trip to visit Srila Gurudev and the devotees of Sri Chaitanya Saraswat Seva Ashram in Soquel, I returned with the same fire that burns ever so brightly in the Soquel devotees' service mood and desire to meet Srila Gurudev's expectations and needs. This is the fire of devotional service and dedication to Sri Sri Guru-Gauranga. While I was there the devotees were gearing up for a fund raising drive to solicit funds to meet the ongoing financial needs of the community. 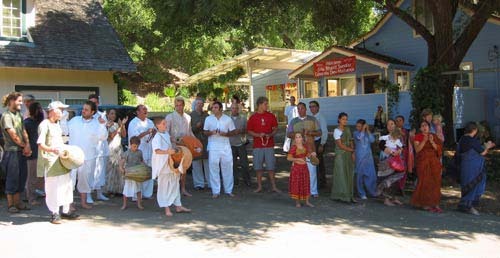 One such avenue open to all servitors is a monthly, personal pledge in support of the Soquel Temple. This is a fund raising method that every devotee should be excited about. Maintaining and expanding the preaching mission at Sri Chaitanya Saraswat Seva Ashram is of paramount importance, and everyone should be willing to sacrifice something in order to see the Seva Ashram prosper and grow. Several years ago my husband, Achyuta Priya Prabhu, and I decided to tithe a certain percentage of our monthly income to Sri Chaitanya Saraswat Math. Taking a percentage off the top of our income first has helped us ensure our monthly giving. It is a routine just like paying any other debt except that we are giving to Krishna first. There are a lot of things an organization's members can do to raise funds, but one of the most important is for members to tithe a certain portion of their individual, personal income to the organization each month. This concept is one that most Christian churches depend on for raising funds and one that can easily be applied in the Vaishnava community as well. Since visiting the Soquel Temple recently, my husband and I have decided to add another percentage point to our monthly tithe specifically to support the Seva Ashram. After having the darshan of the beautiful Deities there, we could do no less. 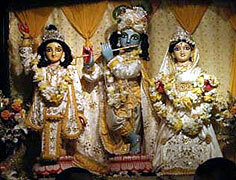 The philosophy in Gaudiya Vaishnavism is that the center comes first. And, it seems to me that everyone needs to understand the importance of giving something to the center first regardless of personal economic status. Everyone can give something. It is easy to think about paying our debt to Krishna after we engage in spending on other things, but the better idea is to pay the Krishna debt first, off the top. Sri Chaitanya Saraswat Seva Ashram belongs to Krishna, and it is a better consciousness to remember to give to Him first. A proper service mood comes from those who give to Krishna in full faith that their needs will be taken care of after His needs are fulfilled. For any mission to succeed, the members have to invest their time, money, and heart. No doubt sacrifices will have to be made by each individual in order to see the mission succeed. By Guru and Gauranga's mercy we are all benefiting from the association at Sri Chaitanya Saraswat Seva Ashram. In order to continue to share that mercy with others, some investment in personal giving has to be maintained.